Copyright �2007 PopEntertainment.com. All rights reserved. Posted: November 10, 2007. It�s an impossible task trying to define Little Big Town. There�s no one like them in country music � or in any genre of music for that matter. And their singularity goes far beyond their unique configuration of two men and two women. Flying high on the heels of their platinum-selling CD The Road to Here (Equity Music, 2006), which spawned such mega-hits as �Boondocks� and �Bring It on Home,� the band has recorded another first-class album in A Place to Land. Their latest musical venture takes the foursome to another level, solidifying their reputation as gifted singer/songwriters with a mature sound distinctly their own. Though the band still feels �new,� they have actually been together for some nine years. 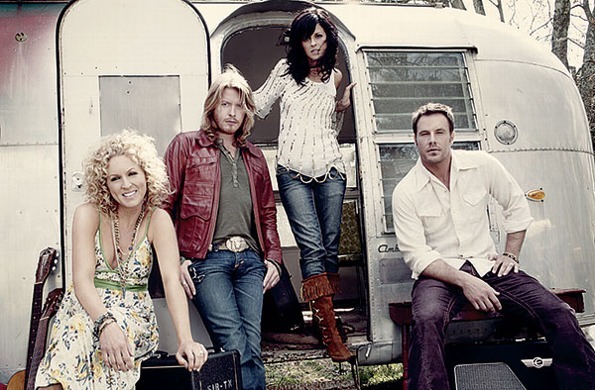 Little Big Town writes almost all of its own music � much of it with their secret weapon, Grammy-winning songwriter Wayne Kirkpatrick. Together they create gorgeous harmonies and indelible melodies and serve them up in sparse, intelligent arrangements featuring top-notch players. The effect is layered and textural: each listen serves up a new discovery, another musical layer. �They work really hard at their instrument,� says Kirkpatrick, who has produced both albums. �Just like a guitarist sits in his room and woodsheds and works on his chops, they are always honing,� he adds. That diligence worked to intriguingly dark effect on The Road to Here, written as Karen Fairchild, Kimberly Roads, Phillip Sweet and Jimi Westbrook recovered from acute personal and professional setbacks. But this is a new era for Little Big Town: Fairchild and Westbrook have married each other, Roads remarried after losing her first husband and recently gave birth to a baby girl, and the divorced Sweet has also remarried. The once label-less band has spent the last two years touring with the likes of Martina McBride, Keith Urban and John Mellencamp (even recording with Mellencamp on his last album Freedom�s Road). In 2007, they won an ACM Award as Best New Vocal Group, and filmed a CMT Crossroads with Lindsey Buckingham. Billboard named them Independent Artist of the Year (2006). And they were nominated for two CMA Awards in 2007: Vocal Group of the Year and Horizon Award. In 2008 they will tour with George Strait � opening the band up to an even wider audience. The CD�s first single, �I�m with the Band,� finds the group placing the listener somewhere between a performer�s love of the road and a fan�s love for following performers. �That song is the cornerstone of the record,� points out Roads. �We wanted a story about the fans because they are the reason we have a career.� A paean to life on the road, the song wears like a comfortable old shirt as it shifts from reflective to insistent. It�s a ballad and a rock song at the same time, and the close harmonies capture the undeniable feel of a Southern-rock song. Like the last CD, A Place to Land opens with a countrified rocker with Fairchild on lead. It�s a wise move � her grab-you-by-the-collar alto and sassy delivery on �Fine Line� pull the listener in from the first note, and she never lets go. �We try not to muddy the waters with too much instrumentation,� says Fairchild, �yet we try to keep it driving with the instrumentation we choose.� With banjos plunking and guitars strumming, the embittered number builds to her aggressive closing ad-libs. If you aren�t tapping your foot at this point, check your pulse. When Fairchild wraps her voice around the tender "Only What You Make of It," she illustrates the breadth of her emotional range. On �Evangeline,� one of LBT�s most intricate tracks to date and the artistic zenith of the album, the band sings to a woman suffering from verbal abuse. �It�s a very emotional song,� admits Roads, who lends her warm bluegrass sound to the urgent lead vocal. The quartet really wails in harmony during the closing, and the effect is like a siren, reflecting the song�s threatening musical undertones. The playful �Novocaine,� with riffs recalling the Steelers Wheel 70s hit �Stuck in the Middle with You,� finds the band doing duet leads � first Fairchild and Westbrook and then Roads and Sweet. During the choruses close listeners will be able to locate the four voices in the vocal spectrum � a daring move indicating the quartet�s vocal dexterity. The song also reveals the band�s uncanny ability to go back to capture a sound and yet create something entirely their own. �There�s been an absence of that kind of music for a long time,� adds Westbrook. Thanks to Little Big Town, that absence has been filled. 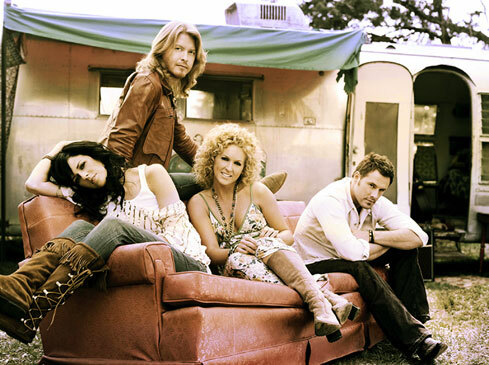 CLICK HERE TO SEE WHAT LITTLE BIG TOWN HAD TO SAY TO US IN 2006! #1 � 2007 Courtesy of Equity Music Group. All rights reserved. #2 � 2007 Courtesy of Equity Music Group. All rights reserved. #3 � 2007 Courtesy of Equity Music Group. All rights reserved.